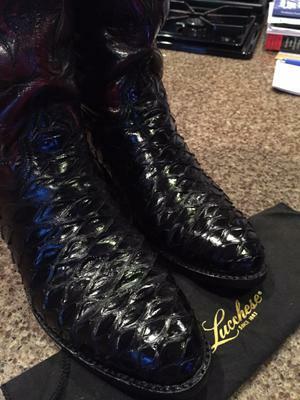 These are genuine men's Lucchese Classics anteater skin boots. They are black cherry in color followed up by inlays on the upper stacks. 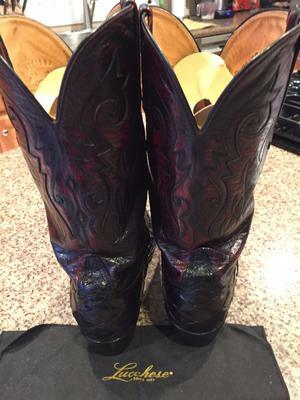 Anteater skin boots with their signature diamond matrix raised leather are some of the most distinctive style of exotic skin western boots. Generally, anteater skin boots are hard to find and made in very limited quantities. In fact very few legal anteater skins are made available each year. When you can find them they will be manufactured in small runs. 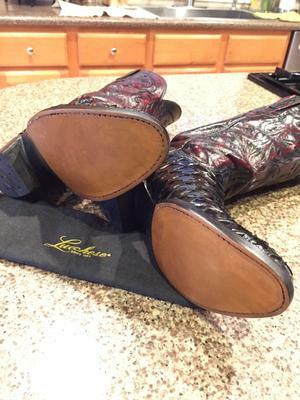 When Lucchese does a run of anteater expect to pay $1,000+ for a pair. These boots are ready for rodeo season and have just been conditioned and resoled professionally by a local cobbler. They are in "like new condition" as you can see in the pictures. I am asking $550 plus actual shipping cost (USPS Priority, insured, signature for receipt)payable via Paypal.